A SCHOOLBOY football team was said to have been left "shaken and shocked" after being subjected to foul-mouthed abuse from Celtic fans when they took to the field at Tynecastle. Scores of supporters were seen making obscene gestures at the youngsters as they jogged past the away stand on a lap of honour during half time of Sunday's big match. The boys club involved - Livingston Hearts - branded their treatment a disgrace and claimed a large section of the away support took part in the booing - although other Celtic fans did attempt to drown out the abuse with applause. It is understood club officials even warned the children to steer clear of the Celtic end in case of abuse being levelled at them while a stadium announcement reminded fans of the age of the team. The under-13 side, which has players as young as 11, had been treated to a training session with Hearts players earlier in the week, which was followed by a short game during the interval. Coach Robert Hardie said: "It is such an exciting day for them, they get to run through the tunnel in front of a packed stadium. Then for that to happen put a real dampener on it, you could see some of them were really shaken and shocked by it. "Fortunately they're kids, so they will bounce back, but it was a disgrace." Although the West Lothian outfit does have links to Hearts the players have a range of allegiances. "There were even a couple of Celtic fans in the team who were really looking forward to going up in front of the fans," Mr Hardie added. "I'm a season ticket holder and this has never happened before. Even when we play Hibs the fans always give the lads a good reception." Hearts fan, John Lee, wrote to the Evening News to voice his displeasure. "I have never seen anything in over 25 years attending football matches that has appalled me so much," he said. "When Hearts play Hibs, Rangers and any other club the youngsters at half-time receive a warm round of applause from both sets of fans." Sunday's match was always likely to lead to high tensions between supporters as it was the first encounter since Celtic manager Neil Lennon was confronted by fan John Wilson on the touchline in May. Several Hearts fans were spotted wearing John Wilson masks during the game to taunt rival supporters. Police said they had not received any specific complaints about the incident involving Livingston Hearts, but were investigating other matters in relation to crowd behaviour at the game. A Celtic spokesman said: "This has to be put into context in terms of the small number of people involved out of a crowd of around 3000. 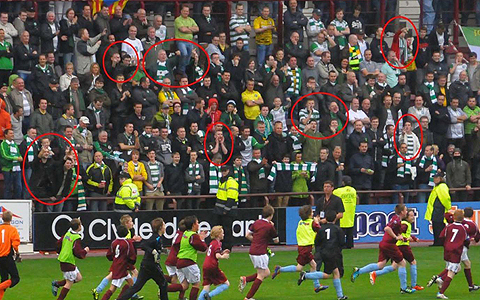 "However small a minority, Celtic absolutely condemns such negative behaviour. We do hope photographs of the home support wearing 'John Wilson' masks receive the same level of analysis."